Congratulations! You just made it through the first month of winter—only two more months to go. There’s a warm baby somewhere in that sling. And yes, that is an armchair made of ice. This is Canada, after all. 1) Rule #1: If you don’t absolutely need to go out in cold weather, don’t. 2) Before slinging, dress your baby warmly, in layers. Remember, they don’t have to be bulky, but have to be warm. Wool, silk, cotton, bamboo, and down are good natural fibres. Fleece (made of polyester) and synthetic, wind-resistant fibres are also good choices. 3) Keep yourself warm. We all know that a happy mama (or papa) = a happy baby. But it’s especially important to keep yourself warm because your body temperature will keep baby warm while you snuggle her against you. 4) Over and under. 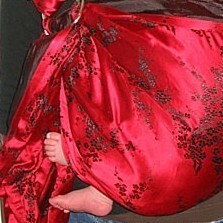 Once baby is wrapped up warmly, use a layer to wrap over and around baby’s body, but under the sling. This adds another, but easily removeable layer. Good choices that we’ve used in the past are wool and fleece, or just use a favourite knitted baby blankie. 5) Tuck them in: most important to keep in mind are extremities like fingers, toes, and noses. If it juts out, it tends to get colder, faster. 6) Face them in. Don’t expose baby’s face and body to the biting wind and snow. When they’re facing you, they’re more sheltered. The Kangaroo Hold (baby on the chest, facing out) is not recommended for cold-weather wearing. A final note: if you’re concerned about your little one’s condition in this cold, rest assured that slinging keeps him warmer than being in the stroller: see point #3 about body temperature. Not only will you be able to keep baby warmer, but because you’re close at hand, you’ll be able to more easily and more quickly detect if any little body parts are getting numb with cold. We hope that these tips help you in moving about in the winter while wearing your baby. So keep warm, keep safe, and happy slinging! This moment of quiet happiness and pride, I have to admit, owed more to the wonders of the sling than to the child himself. Because let’s be honest: Most newborns who are but two days old can pretty much sleep and behave like perfect angels in any restaurant. It’s a good answer that hasn’t changed since. 1- Sharon, a double-sling owner, who was so kind as to bring me a yummy gift from one of the booths that was selling deliciousness. (Thanks, Sharon!) Through three shows, I’ve watched Sharon go from being 8 months pregnant, to mother of an infant, to mother of a now-one-year-old. It’s being able to witness the growth of a customer’s happy child that makes my job great. 2- The nice young man whom I call “Dragon Dude”—besides my husband, he is the coolest slinging dad I know, and it began before he even became a dad! Last year, he came into my booth, asked what these things were for, and caught his eye on the “Dragon” brocade. He promptly snatched it from the hanger and declared, “Oh cool, this is the one I’m buying. Wrap it up!” Not being used to such a quick, easy sale to new parents-to-be, I said, “Would you like to see a demo first, to see how it works?” He replied, “Nah, I just love the looks of it. I can figure out how it works later.” And here he was this year, proudly wearing his new daughter in the sling, and coming back to look for a soft change mat in “Dragon”, to match his sling. Slinging dads like him really make my day. 3- The young “starving student” mom who picked up an EcoLogic cotton sling for her soon-to-be born child, and who was interested in learning about many aspects of natural parenting, including elimination communication and bedsharing. I love it when young parents have their mind open to all kinds of natural, and non-mainstream, parenting choices. 4- Finally, the lovely older woman who was shopping for a baby gift for several granddaughters and grandnieces. She stopped by our booth, took a look at the wide selection of fabrics (declared “gorgeous” and “so many choices!”), had a chat with me about how these slings were different from the competitor’s, and then promptly and calmly ripped up the business card of the competitor, saying, “Well, I guess I won’t be needing this now!” That totally made my entire week. On the other hand, there was one woman who stood out for a negative reason. From time to time, you still hear one of these people who wrinkle their nose up at the sling and declare that it’s totally unsafe and irresponsible to put one’s baby into such a contraption. In this case, it was an older woman who looked like she was in her 60s. When her friend touched the sling on display, and said, “Look at that,”, this other woman declared loudly, “I wouldn’t put a baby into one of those things; they’re so unsafe! The baby’s going to fall out!” Now, if you’re going to walk by my product and make such a statement, you’re asking to be challenged. So I looked up, and said in a cheerful voice, “Oh they’re perfectly safe, as long as you’re using them properly. Just like sitting in a hammock.” Well, didn’t she shoot me the meanest glare, and walk quickly away without a word! I actually enjoy it more when someone like that stays for an extra 10 seconds and has a short dialogue with me, even if they don’t agree with what I say, or never had any intention of buying one. Even if she didn’t want to be educated on the product, it would have been nice if she had stayed and listened to another view besides her own. But walking away quickly with a glare, and without a word, to me shows someone who can’t take the challenge of being challenged. Those customers, I wish would walk right on by without a word in the first place. “In these tough economic times”, what do (should) we give up? Well, in these tough economic times, the good news, according to a Globe and Mail article, is that parents are giving up luxuries such as high-end $600-$1000 strollers (like Bugaboo). You have to admit, whether you’re rich or poor, a designer stroller is one of these things that seems so frivolous and unnecessary in the life and care of a child. I have to admit, I’ve always thought so of the Bugaboos, and felt a sense of satisfaction in reading that article. Now, those of you who have one, or would love to get one, don’t jump on me just yet, and hear me out. My opinion on this is not simply because I’m obviously pro-babywearing, but just because I’m a frugal-minded parent not stuck on brand names. And please don’t think that because I’m a slinger, I know nothing about strollers, or how to judge high-end-New-Zealand-made product versus cheaper made-in-China product. One defense that people have when buying these over-priced strollers is that they’re better quality, and don’t fall apart like the cheaper ones. I was given two second-hand “cheap” strollers, and though I admit that I only ever put a total of about 2 km on them, they were not cheap things that simply “fell apart”, especially considering that they were second-hand, and had serviced one or two children previously. They were still good enough condition that I could proudly pass them on to other sets of parents who couldn’t afford to buy one. Yes, you do get what you pay for (for example, I buy quality shoes, and don’t buy shoes from Wal-Mart, because I know for a fact that they’re poor quality and fall apart quickly). But you also do pay for status markers, and marketing. Yes, things fall apart, but if you take care of a complex product like a stroller, it doesn’t fall apart as quickly as you assume it will. The curious thing about a luxury product retaining its quality and durability is that when people pay a lot of money for something, and expect that they’ll resell it for quite a lot of money, they take really good care of it. When people buy a cheap product, and go into it saying to themselves, “Well, it’s cheap, it’s gonna fall apart anyway, it’s a disposable, entry-level product”, then they don’t care about kicking it around, because in their mind, “it’s cheap, it’s gonna fall apart anyway”. But imagine what would happen if people bought a cheap product, and took care of it as if it were worth close to $1000 . . . You’d be amazed at how long that thing can last, and you’d have less of an excuse to throw it into the landfill and get yourself something expensive and trendy. A second defense in buying expensive strollers: “Well, we jog and walk a lot, and plan to put 1,500 km on this over three years, so it’s a mode of transportation for us, and we need the most durable, reliable beast there is out there.” Again, as a babywearing advocate, I’d have to say that unless you have a physical limitation, you can do all that while carrying, or walking with, a child. I’ve heard people say, “Well, if you think that you can walk with kids on a busy city street without a stroller, then you obviously don’t have kids.” But wait. I have two kids. I’ve carried/walked with them on busy streets in downtown Toronto, Montreal, Vancouver, New York City, Las Vegas, etc.. I’ve carried them since they were one day old, to 6 years old. I’m a small woman with short legs. And yes, I did have a physical limitation. So don’t tell me it’s not possible. It’s not possible if you’re set on saying to yourself that it’s not possible, or simply because you don’t want to. Excuse number three: “I put it on my gift registry, because my friends were chipping it to pay for it. So I don’t feel guilty spending that amount of money.” Well then, that’s the worst reason of all. Then you’re buying it because it’s an expensive brand-name that allows you to get in on the trend without worrying about the financial aspect. Slam me all you want on this topic if you don’t agree, but I’m glad that the tough economy is the impetus for some serious thinking on the place for luxury non-necessities. The bad news: The tough economic realities haven’t necessarily hit parents who want to keep up with the Joneses and their kids, when it comes to children’s extra-curricular activities and classes. Taking out a credit card to pay for Junior’s dance class? Maybe not enough of us have hunkered down to think about the life’s necessities after all. Last week, I made a decision to make my business life a little easier, less stressful, more dedicated to my direct customers, and frankly, more profitable: I cut out (practically all) retailer/wholesaler accounts. By this, I mean that I won’t be selling to retail or on-line stores, with the exception of the aforementioned four for now, who are reliable, high-volume buyers, and whom I won’t have to chase down for accounts payable. With this move, I can concentrate on providing more time and customer service to the direct consumer, and spend less time worrying about retailers who sometimes require a lot of time and energy. With so many customers who find me by way of the Internerd anyway, maybe this is the way of the future. In this, my first full week after my big decision, it seems like a lot of the stress has been lifted off my chest. No really, literally, I just feel lighter and . . . I dunno, happier. Hopefully, what I’ve lost in point-of-sale visibility, I will gain in more word-of-mouth advertising, if I can step up my efforts to service the direct consumer. It was a tough decision, but one that needed to be made, and frankly, the right one. 1) First off, the economy was the undeniable elephant in the room, and the question that surfaced periodically was how we sellers of consumer goods would fare this year. How much were people willing to spend on gifts or necessities this year? Although it was still a great financial decision for me to exhibit at the show, same as last year, I realised that for some of the other sellers, it was not a profit-turning venture, and they had to seriously consider whether or not to come back in the spring, and then the 2009 show. I know that we were all affected negatively by the economy, whether we were selling slings, soaps, jewellery, or knick-knacks. The bad economy is here to stay for awhile, so the spring show will no doubt still be a question mark. Let’s hope that by Christmas 2009, we see better financial times. 2) The Bad Experience: The Competitor. On one of my busy days, I encountered the first of only two negative social interactions at the Show: I met one of my competitors. For a full year, through two shows, I was lucky enough to have been the first and only one to sell slings. My friends and fellow exhibitors warned me ominously, “Enjoy it. It won’t last. Once any of your competitors find out that you’re here, they’ll be in.” And true enough, this Christmas, I noticed two other sling-sellers listed in the guide. Now I don’t mind a little healthy competition, because I’m confident enough in my product to know that I can stand out. My only fear would be losing a sale to a customer who walked the show in a certain order, and would find one of the competitors (and make a purchase) before they had a chance to visit my booth. (At trade shows, just as in real estate, location is key.) So while I have nothing against other sellers at the show also hawking slings, I’m not out to make friends with them. Apparently, though, one of them didn’t mind coming to chat me up. On one of my busy days, a woman approached me during a lull and introduced herself with a cheery, “Hi, I’m (insert first and last name here).” For a moment, I racked my brain, wondering if I had met her before, or if she was on my customer list. So while I understand that everybody has to make a living and even “check out the competition”, I personally feel that a healthy distance is required and appreciated among competitors in such a small retail setting. The smile and introduction on her part certainly didn’t make that sling-seller any closer to me. And the only thing worse than the bad experience with the Competitor was . . .
3) The Bad Experience: The Customer. On a Thursday afternoon, I had a most astonishing and unfortunately memorable experience with a bad customer. Bright and early, on the dot as the show opened at 11 a.m., a woman and her mother entered my booth, all eager. (You have to know, being located in the middle of the vast convention centre, we in aisle E generally did not see customers on the dot as the show opened. If someone was there at the opening bell, it was for a very specific reason, and they knew that they had to go to this location first.) Little did I know what they were so eager about. I gave them a moment to talk privately between themselves, and when I smiled and approached them, I caught these words on the daughter’s lips, and then her mother’s murmured reply: “Well, what do you think?” “Hmm, you’re right. I haven’t seen this type of construction at the shoulder before.” She then proceeded to turn over the sling shoulder, and inspect the hem. “May I help you find something?” I asked them politely. “Oh no, we’re just looking for now,” replied the daughter. “I saw you earlier this year at the Spring Show, and I have two children. Someone gave me a second-hand sling for my first child, and it’s falling apart now, so I need one for my second child. But I can’t buy one just now.” Well, at least she was honest. Then the next question, from the mother, caught me slightly off-guard in its frankness. “Where do you get these rings?” she wanted to know. Many other Copiers before her have posed the same question, and they get the same type of guarded response from me: “These are strong, industrial rings that I buy specially. They’re rated to withstand a weight of up to 400 lbs.” Here, I paused and then said firmly, “You’re welcome to try on a sling.” The daughter politely declined, and with that, the two walked off. At 3 p.m., when my employee, T., showed up to help me at the booth, I eagerly relayed to her what had happened this morning with the daughter-mother team. I warned her that there would be customers like this, who are inspecting carefully a seam, while nonchalantly asking questions about measurements and suppliers. Fifteen minutes later, as my back was turned to T. and I was helping another customer, T. tapped me on the shoulder and said excitedly, “Was that her? The woman from this morning?” She pointed to the back of a woman quickly walking away from my booth. The audacity of that customer shocked me. The nerve! Having not received an answer from me this morning about the sling’s width, she had decided on purpose to wait her turn, when I would be pre-occupied, to come and get her measurement herself, without permission! Now, dear readers, you have to understand that the show management has always had a strict “no photography, no videography without permission” policy in place. This is designed to protect the ideas of hard-working designers so that crafty do-it-yourselfers won’t come into the place, snap a photo, and then head to the privacy of their home to “duplicate” that great item. To me, boldly pulling out a measuring tape was just as bad, if not worse, than snapping a photo; the intention was still the same. With that thought, I left T. in charge of the booth and immediately went off to find management, to relay the story. They sympathised with me, and said that if I saw either that daughter or mother on the Show floor, to alert security, who would have a word with them. But what would have been the point? With her measurement already tucked in her mind, she was already long gone, and would have no reason to return. My only triumphant thought was that in her rush to grab that number without being seen by me, she had measured too hastily, and had come up with an incorrect measurement! I wonder how safe that baby will feel in a sling made with a wrong measurement . . .
My only consolation after these two experiences was that I’m certainly not the only one to have gone through that. It’s amazing, once you rant and complain, how many other similar stories you hear from other designer friends, on the topic of idea-stealing competitors and customers. So, what did I learn from this year’s show? It’s a tough world out there in consumer retail, especially during a bad economy. We all have to survive, some of us in different ways than others.